The Pacific coastal border region between Colombia and Ecuador has heated up amid an offensive launched by a fast-growing dissident group made up mainly of former FARC members and militias who have rearmed. The “Oliver Sinisterra” group, named for a former FARC commander killed in combat with Colombia’s army, is led by Walter Artízala alias “Guacho,” an Ecuadorian border-zone citizen whom the FARC recruited in 2007. It has between 70 and 450 members. Guacho’s group has carried out the most spectacular attacks in the region so far this year. In January, it set off a car bomb in Esmeraldas, Ecuador, that wounded 28 people. In February, it launched a mortar at an Ecuadorian Army post, with no casualties. On March 20, it set off a roadside bomb in Ecuador, killing three Ecuadorian soldiers and wounding eleven. On March 26, the dissidents kidnapped three reporters from Quito’s El Comercio newspaper from the border zone, and appear to have brought them to the Colombian side. Ecuadorian authorities say they are in contact with the kidnappers and that the captives are in good health. On the night of March 26, the Pacific port city of Tumaco, near the border, was blacked out after Guacho’s group bombed an electricity pylon. It took several days to restore power. This city of 200,000 people—never a peaceful place—has been hit by a wave of violence, with 67 homicides during the first 85 days of 2018. FARC dissident groups like Guacho’s are growing quickly around the country. Colombian armed forces chief Gen. Alberto Mejía said last week, “Today there are 1,200 of them dedicated to narcotrafficking and criminal economies; depending on the region, they make alliances with other armed groups.” Ariel Ávila of Colombia’s Peace and Reconciliation Foundation think-tank estimated that 800 of them are guerrillas who have abandoned the demobilization process, and the rest are new recruits. 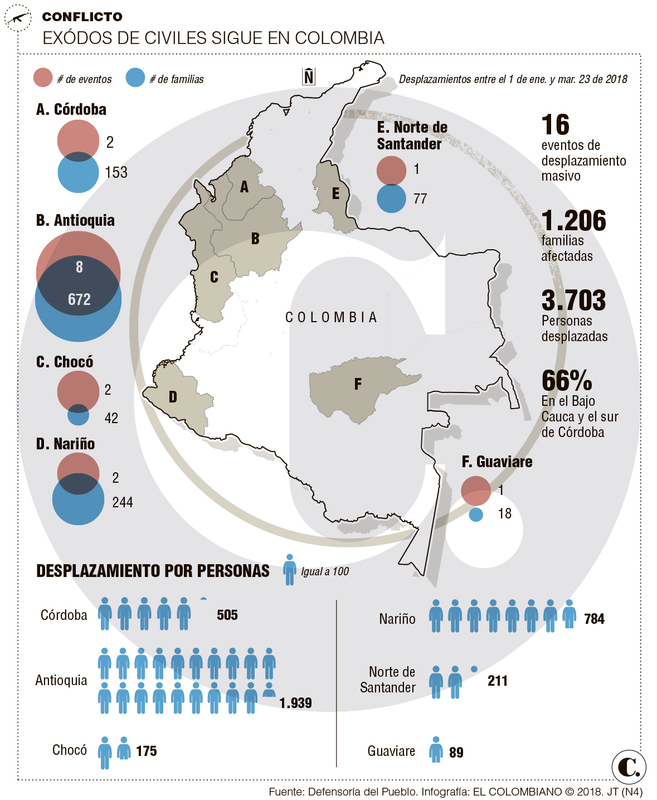 Of the 242 (out of 1,100 total) Colombian municipalities, or counties, where the FARC once had influence, Ávila told El Colombiano, dissidents are now active in 48. A “high source” in the governor’s office of Nariño department, which includes Tumaco, told the La Silla Vacía investigative site that Guacho has been in conversations for a possible alliance with what may be the country’s largest dissident group, that of alias Gentil Duarte in south-central Colombia. The site could not confirm this rumor. directed the criminal activities of the “Gulf Clan” [one of several names used to refer to the Urabeños] on the Pacific and Caribbean coasts and in the Magdalena Medio region.… In addition, he coordinated criminal alliances with narcotrafficking structures in Panama, Costa Rica, Honduras, Guatemala, and Mexico, for the permanent export of loads of cocaine, by sea and land, to the United States and Europe.… According to the [Police intelligence] investigation, the capo paid between 10 and 15 million pesos [US$3,000 to US$5,000] for virgin girls and adolescents, and loved imported products, especially whisky, cariar, cheese, and other canned goods. With a number of top lieutenants out of the picture, Otoniel will have to replace his inner circle with people who do not necessarily have the same level of experience and knowledge as their predecessors.… Now that the Urabeños’ operations on the Pacific coast are leaderless, competing groups like the National Liberation Army (Ejército de Liberación Nacional – ELN) could try to scoop up territory that the weakened group no longer has the power to control. Tensions continue in Catatumbo, a region of highly organized campesinos and extensive coca cultivation in Norte de Santander department, following a March 14 shootout that signaled the breakdown of a years-long truce between two leftist guerrilla groups. The FARC, the ELN, and a small local group, the Popular Liberation Army (EPL), had long coexisted. But with the FARC out of the picture and the EPL undergoing leadership changes, intensifying ELN-EPL competition has worsened the security situation. A March 26 update from the UN Office for the Coordination of Humanitarian Affairs (OCHA) warns that since March 14, insecurity has affected more than 20,300 people in the municipalities of San Calixto, El Carmen, Hacarí, Sardinata, El Tarra, and Convención. 12,500 have been unable to access basic goods and services. About 3,000 are confined to their communities. More than 2,400 have been displaced. Over 2,360 children have been unable to attend school. The Bajo Cauca—several municipalities in northern Antioquia department, a few hours’ drive from Medellín—may be the most violent part of Colombia right now. The cause in this longtime cocaine-producing region is fighting between the Urabeños and a local organized-crime group called “Los Caparrapos.” Along with neighboring southern Córdoba department, Bajo Cauca leads the country in forced displacement so far this year. And it has seen an alarming wave of killings of social leaders. Víctor Alfonso Zabaleta, the president of a Community Action Board in Cáceres municipality and a participant in a government coca-substitution program, was murdered on March 25 along with another campesino. That same day, Jorge Miguel Polanco, a former Community Action Board leader, was killed along with his son. As reported last week, Community Action Board leader José Herrera was killed on March 20 in Caucasia. According to the Ombudperson’s Office, 22 human rights defenders were assassinated in Colombia over the first months of 2018.… According to an Ombudperson’s report, between January 2017 to February 2018, there have been 121 murders of human rights defenders.… The Commission observes with concern that plenty of those murdered human rights defenders carried out actions aimed at implementing the peace agreements related to land distribution. In addition, the Commission has received consistent reports indicating that indigenous and Afro-Colombians human rights defenders are exposed to aggravated violence. MacManus is a career Foreign Service officer, whose Senate Foreign Relations Committee nomination hearing on March 8 was mostly uneventful. He is opposed on the far right, however, because he was on Secretary of State Hillary Clinton’s personal staff during the 2012 attacks on the U.S. consulate in Benghazi, Libya, which became a cause celebre for Clinton’s political opponents. During the hearing, Sen. Marco Rubio (R-Florida), the chairman of the Foreign Relations Committee’s Western Hemisphere Subcommittee, asked MacManus about his role in Benghazi, but did not pursue the line of questioning very far. Opponents of MacManus’s nomination may also want president Trump to nominate a political appointee—a non-diplomat who shares the president’s “America First” outlook—instead of a career diplomat. The Free Beacon article speculates that the arrivals of hardliners Mike Pompeo and John Bolton to the posts of secretary of state and national security advisor might spell an end to MacManus’s nomination and the naming of a more ideological appointee. It’s not clear, though, how a more extreme nominee could win approval in the Senate, where Republicans hold a fragile 51-49 majority and where the Foreign Relations Committee’s chairman, Sen. Bob Corker (R-Tennessee), is a Trump critic who will retire at the end of this session. Joshua Mitrotti, the longtime director of the Colombian Reincorporation Agency (ACR), has left his post, La Silla Vacía reports. The Agency attends to ex-combatants who seek to reintegrate individually into civilian life, and some aspects of the reintegration of those reintegrating collectively, as most of the FARC has sought to do. Mitrotti said he had told President Juan Manuel Santos two months ago of his desire to leave his post for personal reasons. He will be replaced by Andrés Stapper, a lawyer with 11 years’ experience at the ACR. La Silla Vacía notes that the reincorporation process is in rough shape, as the government and guerrillas never agreed on a collective reincorporation policy. The good news is that of 12,535 ex-FARC combatants accredited by the Office of the High Commissioner for Peace, more than 12,000 have a bank account where they are receiving 24 monthly payments of about 90 percent of minimum wage ($220). More than 11,000 are signed up with the national health system and 8,000 with the national pension system. 3,976 have received at least a few days’ vocational training. But there have been “few advances” on “productive projects,” usually agricultural investments, “which are thought to be how they would make a long-term living.” The FARC want the government to disburse 8 million pesos (nearly US$3,000) to each ex-member, as agreed in the accord, so that they may launch their projects. The government does not want to turn over the money until all ex-guerrillas have received training and all projects have been approved by a body that includes the ACR director, the National Reincorporation Council. Of the 26 zones where FARC members congregated to demobilize in early 2017, only four have active, approved productive projects currently underway. Kimberley Brown, “Why Are Former Farc Rebels Leaving Reintegration Camps?” (Al Jazzeera, March 30, 2018). Juan Fernando Cristo, “¿Circunscripciones de Paz para las Farc? Otra de las Grandes Mentiras” (El Tiempo (Colombia), March 30, 2018). Juan David Moreno Barreto, “La Paz en Putumayo Tiene Rostro de Mujer” (El Espectador (Colombia), March 27, 2018). Juanita Velez, “Las Alarmas del Empantanado Posconflicto” (La Silla Vacia (Colombia), March 26, 2018). Cecilia Orozco Tascón, “Presidente de la Corte Constitucional: “Comision de la Verdad, el Derecho de las Victimas”” (El Espectador (Colombia), March 26, 2018). “En el Congreso, la Paz Va a Medio Camino” (Semana (Colombia), March 26, 2018). Javier Alexáznder Macías, “El Desplazamiento, un Mal Que Aumenta Aun Con Acuerdo de Paz” (El Colombiano (Medellin Colombia), March 26, 2018). Nelson Ricardo Matta Colorado, “Asi Cayo el Espia del Eln Que se Infiltro en el Ejercito” (El Colombiano (Medellin Colombia), March 26, 2018).